Cubase SE 3 is a good entry-level sequencer, but the instruments it comes with are very limited. Lots to play with. New Virtual Bassist instrument. Excellent entry level sequencer. Offline Process History. Virtual instruments aren’t great. Basic mixer view only. Plenty of manipulation tools on-hand. The piano roll opens up further options. Multiple piano rolls in use. Make your adjustments in style. You may feel cheated by the cut-down plug-ins. Studio Case II contains the Cubase SE sequencer plus ‘Special Edition´ versions of HALion, The Grand, D´Cota, Virtual Guitarist Electric Edition and Virtual Bassist. The package comes in a huge box but installs from just two DVDs (one for the sequencer and one for the plug-ins). You also get all the manuals and the requisite USB Steinberg Key. The six virtual instruments are installed in one pass and around 1.3GB of free hard disk space is required. 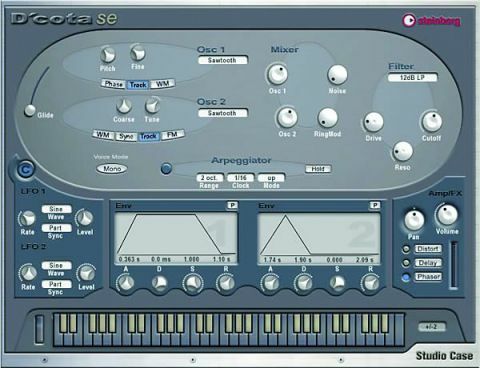 Aesthetically, the sequencer is identical to SX 3. However, on closer inspection, there are some significant omissions. As with its predecessor, Cubase SE 3 can load 16 virtual instruments and 48 audio tracks per project. Each track can host five insert effects and eight send effects, which is provision enough for most projects. What you don´t get are any of the really meaty functions from SX 3, such as Audio Warp, the Play Order track or in-place MIDI editing. The mixer panel remains devoid of expandable panels for input/ output routing and EQ/effects editing, but such procedures can be carried out elsewhere. On the upside, the life-saving Offline Process History has made it into SE 3, as has the Equaliser Curve function that enables you to draw in EQ adjustments from within the Inspector. Virtual Bassist SE is the Studio Case´s only new instrument. Unfortunately, many of the juiciest features have been removed in this version, namely the Groove Match page and the wealth of amps and effects. That said, all of the tonal controls remain and the instrument does sound great. Disappointingly, no changes appear to have been made to any of the other instruments. Cubase SE 3 is a remarkably full-featured sequencer, and one of the best entry-level options around. However, you do feel like you´re paying for the privilege of demoing the Studio Case II´s instruments. They´re not of poor quality, but they are very limited. If you´re a beginner, Studio Case II is worth a look, but more demanding users would be better off investing in the standalone version of Cubase SE 3 and a few choice plug-ins - or even a soft studio like Reason or Project5.